Violence Flares After Israeli Operation In Gaza Turns Deadly Sunday's operation in the Gaza Strip left one Israeli and seven Palestinians dead. A day later, Israel and militants in Gaza traded hundreds of rockets and mortar shells. 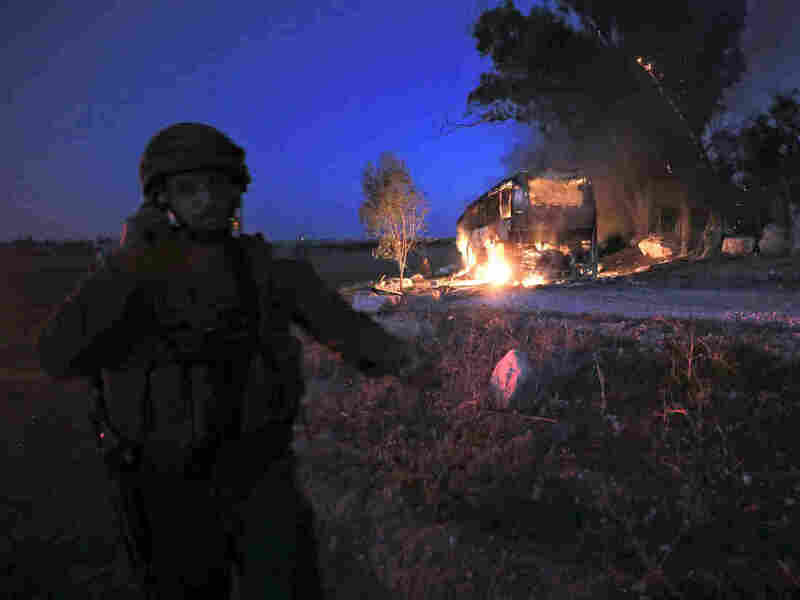 An Israeli soldier stands near a burning bus that was hit by a mortar shell fired from Gaza on Monday. Militants in Gaza fired rockets into Israel for a second day on Tuesday as Israel bombed targets in the Palestinian territory — a round of violence prompted by an Israeli military operation over the weekend that caused the deaths of seven Palestinians and one Israeli. It is unclear why Israeli special forces entered the town of Khan Younis in the Gaza Strip on Sunday and why a firefight erupted. "The special operation yesterday was not intended to kill or abduct terrorists, but to strengthen Israeli security," a spokesperson said, adding that the battle was "very complex." The Israeli forces entered Gaza in a civilian vehicle and were stopped by members of Hamas' military wing, the Izzaldin al-Qassam Brigades, according to the Islamist group, long considered a terrorist organization by the United States. Hamas says the Israelis opened fire on Palestinians who "tried to thwart the attack." An Israeli officer was killed in the exchange of fire. "The citizens of Israel owe him a huge debt," said Prime Minister Benjamin Netanyahu, who made an early exit from Paris, where he and other world leaders were commemorating the end of World War I.
Hamas called the operation an "assassination of a senior leader." It said a local Palestinian commander, 37-year-old Nour Baraka, was killed, and six others also died. Five of the men were affiliated with Hamas and one person was a member of the Popular Resistance Committees, according to Reuters. As their burials got underway, thousands of mourners stood alongside camouflaged gunmen and chanted "revenge," according to The Associated Press. "What is being done by the Palestinian resistance proves that it is prepared and ready to defend the Palestinians," Hamas Spokesman Fawzi Barhoum said Sunday. Since Monday, some 400 rockets from Gaza were launched into southern Israel, the country's military said, adding that about 100 of them had been intercepted by Israel's Iron Dome defense system. Air raid sirens were sounded across the region, and nearby schools closed and train service halted. Hamas media said that rockets hit a house in Israel, and the military posted a video on social media of "multiple Israeli homes" that were hit. Israel's military announced that it had dispatched fighter jets and was "striking terror targets in the Gaza Strip" – including compounds, observation posts and a rocket launching squad. The military said more than 70 militant targets in the Gaza Strip were hit, Naomi Zeveloff reports for NPR from Tel Aviv. As the day progressed, both sides saw the reported number of casualties rise. Palestinian health officials said that two people were killed and three others wounded in the Israeli strikes, Reuters reports. In Israel, at least 10 people were injured in the rocket attacks, the news service reports, citing medical officials. A 19-year-old man was severely wounded after a mortar shell hit a bus, whose driver had a panic attack and was also taken to the hospital, according to the Times of Israel. Monday's clash came days after Hamas had quieted recent protests along the Israeli border and Israel was allowing more aid to flow into Gaza. The AP says the United Nations and Egypt are trying to mediate an end to this latest outburst of violence. 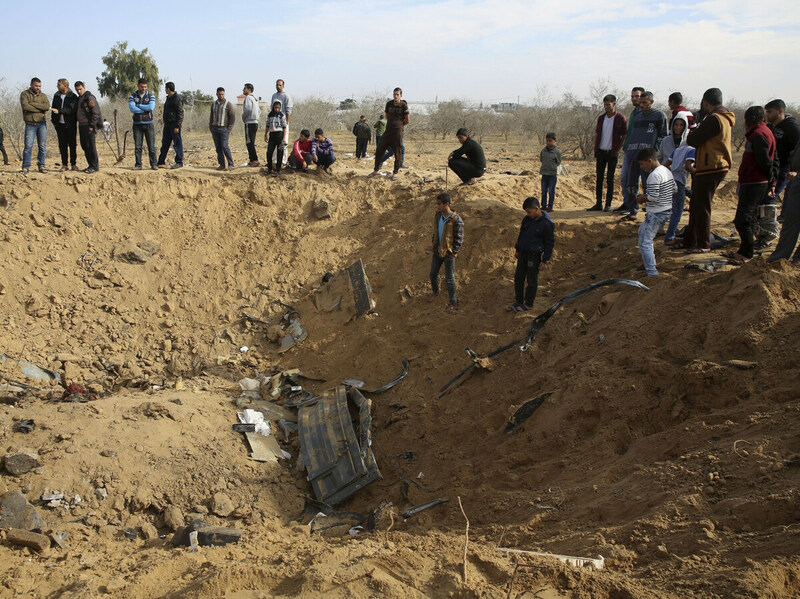 Palestinians inspect a crater made Monday by an Israeli strike east of Khan Younis, in the Gaza Strip.